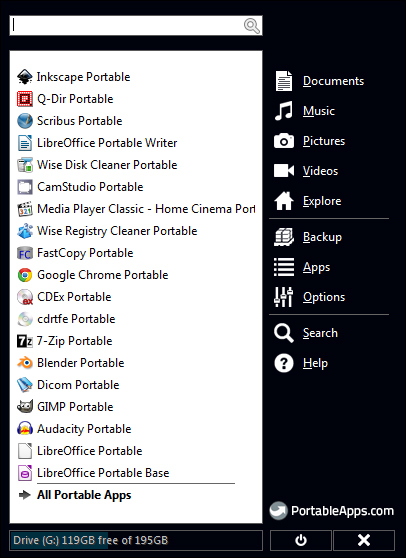 After a review about PortableApps.com for Windows, here I come again with a review about portable application set, now for Linux. The name is so similar to the one I reviewed before: PortableLinuxApps.org. But, unlike the PortableApps.com, PortableLinuxApps.org doesn’t give us a managed launcher that looks like a start menu. 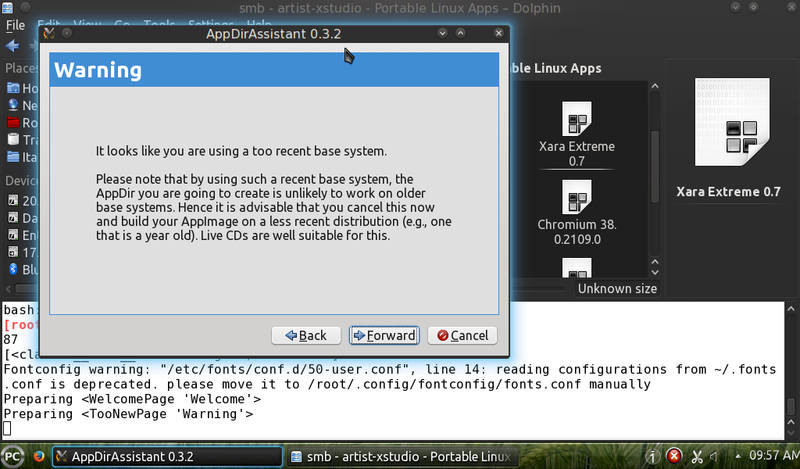 The applications provided by PortableLinuxApps.org are stand-alone and come in <.bin> file format. They can be executed directly from the directory where they are saved. Visit PortableLinuxApps.org to download your favorite application(s) and save to your preferred directory or USB flash-disk. Choose the 32-bit or 64-bit version as you need. After you download the application(s), in your terminal, cd to the directory of your downloaded application(s). Use “root mode” (sudo su, su, etc.) if necessary. 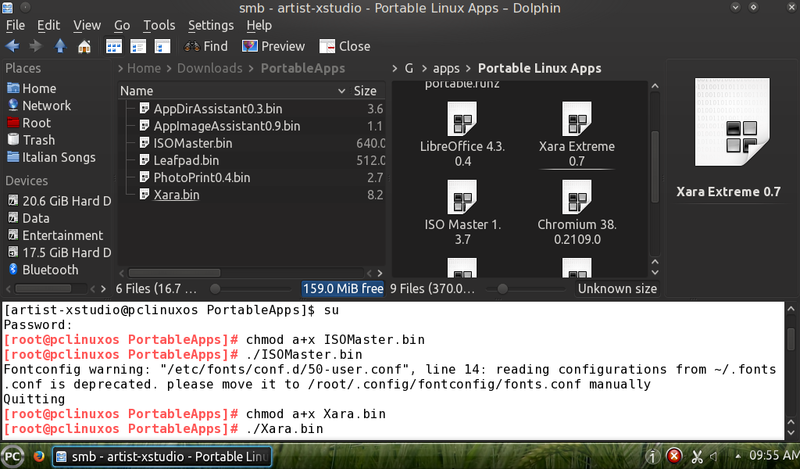 By the way, I’m running PCLinuxOS where I can access the integrated terminal directly right from my Dolphin (file manager). If you are running a different distribution, it’s better for you to find out the information, whether your file manager support an integrated terminal or not. Click the image below to enlarge. Ensure that the files you downloaded are in <.bin> file format and has no space in the name. If you find the file format is not <.bin>, rename the file name into: bin, name-of-application.bin, name_of_application.bin, etc. Type command: chmod a+x name_of_apps.bin to change the access rights and type ./name_of_apps.bin to execute the application. Although PortableLinuxApps.org provides almost all portable Linux applications as a ready-to-use application, for some reasons, we might want to create our own applications collection. And for Linux users, luckily, it’s so easy and almost cost nothing (except the bill of internet connection, of course). To create a portable application, you will need AppDirAssistant and AppImageAssistant. So, if your Linux distribution doesn’t have them in its software center, you can download the portable version and run them manually from http://sourceforge.net/projects/portable/files/ (for 32-bit Linux) or http://sourceforge.net/projects/portable/files/64bit/ (for 64-bit Linux). 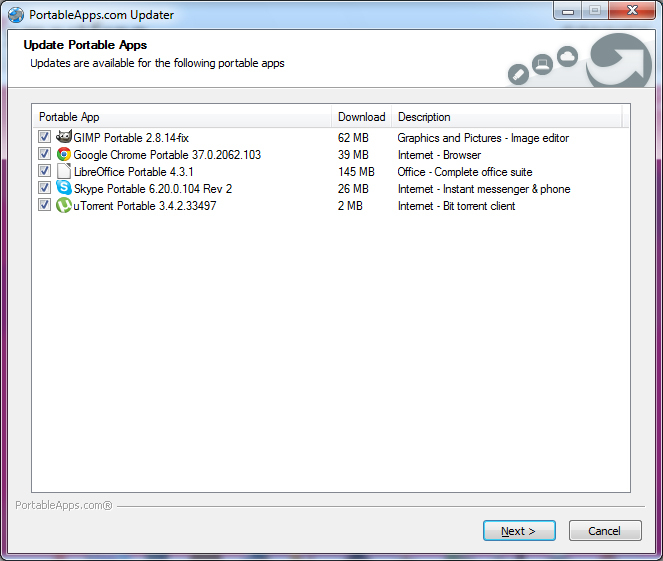 Portable applications are always a good thing since they make us able to do any work, anywhere and anytime—borderless. They are tiny applications that won’t spend our disk space. Their portability and their file format are supported (recognized) by all Linux distributions, so we will never be worried about unable to run an application in a various Linux distribution. Just the same as other Linux applications, to run or to install or to create a package of a particular application, sometimes we still rely on “typing a command” feature. For a Linux newbie, it might be pretty hard to understand and remember the commands sequence. But for me, nothing too hard if we want to keep learning :). But, the problem above is a “tradition” on Linux. The only part of PortableLinuxApps.org I quite “hate” is that there is no Help/Contact/Forum page on the web site. Whenever a newbie like me need help, nobody can help, except asking someone from other forums. That’s all. Just the same as the package for the Windows version, PortableLinuxApps.org also comes to meet our daily mobile computing under major Linux operating system, so it’s crucial to have them in our removable media (USB flash-disk, portable hard-drive, etc.). Today, it’s undeniable fact that we are living and relying on a mobile computing. Office works, multimedia tasks, building up online community, etc. are all centralized in portable devices. No more must-sit in front of big CPU. In fact, wherever and whenever we go, the demand of staying close to the favorite applications—or even the “obligatory” applications—is a must. So, portable applications should be the answer of this need. You might have already known PortableApps.com. This very cool application set is geared with a lot of portable applications that are managed under many categories and mostly are FOSS applications (originally were developed and run under Linux but also were developed to run for Windows). We can customize the looks (color, theme, UI language, etc.). Because portable applications are the light version of their installable version, you may find some apps get crashed or unstable for once or twice. 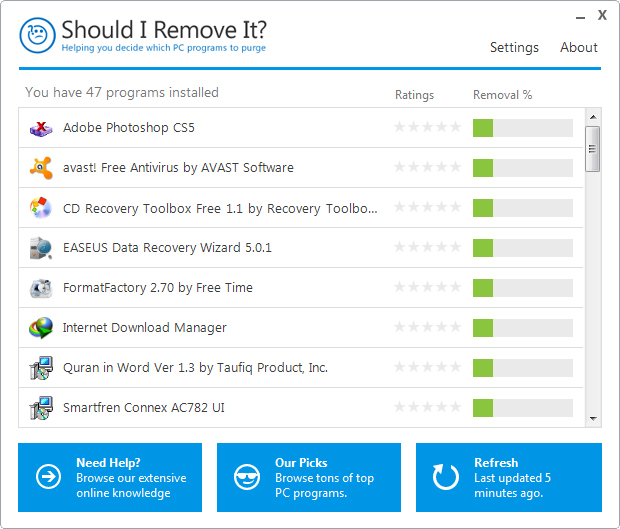 When we buy a new computer, sometimes we get third parties’ pre-installed software that sometimes we don’t really need them. Or maybe, we love to do an experiment by installing various software in our computer, without knowing whether the application is really needed or not.